Issue XVI Vol. 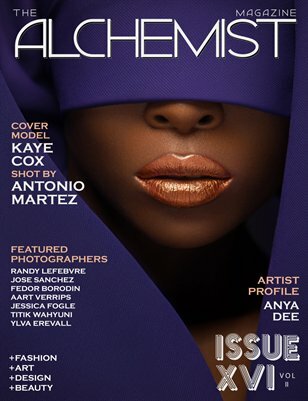 II of The Alchemist Magazine features model Kaye Cox on the cover photographed by Antonio Martez. The issue also features photography editorials by: Randy Lefebvre, Jose Sanchez, Fedor Borodin, Aart Verrips, Jessica L. Fogle, Titik Wahyuni and Ylva Erevall. Featured Artist: Anya Dee.